A typical index entry consists of Name (Last name, Given name), Notice date(s), Death date if given in the notice, Maiden name if given, and Age at Death if given. Some indexes also include an indicator (asterisk) that the Place of Birth is given and some include the newspaper page. Copies of the original newspaper death notices are available on microfilms in the Information & Reference Dept. of the Public Library of Cincinnati and Hamilton County (PLCH) in downtown Cincinnati. See more information below on obtaining copies from the PLCH. In-Print: The index books listed as YES in this column in the table above are available for purchase via our Shop & Support page in the Other Publications section. All eight books are available as reference volumes at various branches of the Public Library of Cincinnati and Hamilton County (see "Acquiring a full index entry" section below). Members Only Online Full Index: The indexes from the five books listed as YES under this column in the table above are the full (complete) indexes and are available in a searchable database via our Death Notices 1827 - 1920 page. You must be a logged-in HCGS member to access this database. See Join & Renew ... memberships are available for as little as $15/year that would give you access to this members-only database! Note: Maiden Name and Place of Birth Indicator, where given in the notice, are not yet visible in this database but will be added in the future. Public Online Abbreviated Index: Abbreviated indexes from the books listed as YES under this column in the table above are available in searchable Acrobat PDF files via the table below according to the first letter of the Last Name. A typical abbreviated index entry consists of Last name, Given name, Place of Birth indicator (asterisk in POB column), Maiden Name, Publication year, and Newspaper. Join Us!! - Full/complete indexes are available to HCGS members online for five of the books. Order the book if it remains in-print (see table above) from our Shop & Support page in the Other Publications section. Search all eight index books at the Cincinnati downtown Main branch of the PLCH in the Genealogy & Local History Dept. and the Information & Reference Dept. and also at other area libraries such as the Cincinnati History Library & Archives (CHLA), and the Cincinnati Family History Center of the Church of the Latter Day Saints (LDS). Search WorldCat for other libraries that have the index books. Order a Lookup from our Research Committee as described on our Research Services page. Hire a professional researcher. A list is available on the HCGS Research Services page. See the following section Acquiring a copy of the death notice/obituary if you want to obtain a copy of the notice, once you have acquired the full index. Most 20th Century newspaper death notices and obituaries, as well as other articles, have been indexed by the Public Library of Cincinnati and Hamilton County (PLCH) into their Newsdex searchable database. A PLCH library card is not required. See the following section Acquiring a copy of the death notice/obituary if you want to obtain a copy of the notice, once you have acquired the full index. While the ProQuest Obituaries database can be searched as mentioned above as a separate source for death notices and obituaries it can also be used to obtain copies of some death notices that have been indexed in the Newsdex index. See the link to ProQuest Obituaries on the the Research Databases: Genealogy page of the PLCH website. PLCH Magazines & Newspapers Dept. Visit the department at the downtown Main branch and make a print or digital copy from the microfilm. Bring your own flash drive if you intend to make a digital copy. Departmental staff will provide assistance if you are not familiar with the steps. Contact the department via email or phone and request a copy. They will provide up to three newspaper notices per order as long as the name of the deceased, the full date, and the newspaper name are provided. A page number is required for 20th Century papers, e.g., from a Newsdex entry. They will accept two orders per day. They will fulfill the request via email with a digital copy for free, but if they need to fax or snail mail your order, there will be a $0.20 charge per copy. Turn around time is about 24 hours. ⇒ NOTE: Please see our special note regarding German Umlaut and Eszett letters in the death notices. The Cincinnati Enquirer from 1841 through 1922 has been scanned with optical character recognition (OCR) and is available from ProQuest Historical Newspapers via the PLCH Genealogy Research Databases page to library card holders. You may be able to find death notices, obituaries, or other articles of interest. This index has over 26,800 deaths, which were reported and published before 1899 throughout the United States, with the majority of them from the Midwest area. The newspaper was begun in 1839 by Rev. Wilhelm Nast in Cincinnati. As his influence spread, he recruited many more ministers to support the German Methodist movement, and the founding of many more local churches in the area, which eventually expanded to include most of the United States and Europe. The death notices contained in this index therefore include people that lived in all parts of the United States in the 19th and early 20th century, and also include approximately 85% of the towns of birth in the death notice. This makes the index of benefit to researchers throughout the United States looking for the place of birth of their German ancestors, as well as researchers in Germany trying to find what happened to relatives that left the area and settled in the United States in the 19th century. The data fields in the index are: Name of Deceased, Maiden Name (if published), Notice Publication Date, Death Date, Age at Death, Page, City of Death, State of Death, Birth Place (if published), and State/Province of Birth (if published). Print Edition: Available as a 604 page print volume that can be purchased online from this website and paid for using PayPal for $39.00. You can use your PayPal account or a credit card if you do not have a PayPal account. Please go to the Other Publications section of our Shop & Support page. Members-Only Full Index: All records and fields are available via our Christliche Apologete Full Index online searchable database. You must be a logged-in HCGS member to access this database. Memberships are available for as little as $15/year that will give you access to this members-only database. The fields are the same as in the print book: Name of Deceased, Maiden Name (if published), Death Date, Age at Death, City of Death, State of Death, Notice Publication Date, Page, Birth Place (if published), and State/Province of Birth (if published). Public Abbreviated Index: An Abbreviated Public Index in searchable PDF format is available for non-members. Note: The file is 6.1 MB and may take a couple of minutes to download. This index contains the following fields: Name of Deceased, Maiden Name (if published), Notice Publication Date (month and year only), Age at Death, Place of Birth Indicator, and State/Province of Birth. The Place of Birth Indicator will have the value of "Yes" if the original death notice had this information, in which case the print edition and the members-only online searchable index will have this detailed information. The publication issues used for this index are the hardbound original newspapers located at the Cincinnati History Library and Archives. These copies have never been microfilmed, and are currently only available at the library in paper, hardbound format. Copies of individual original death notices can be requested. See the full Introduction. 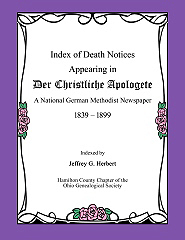 If you are not a member of HCGS and want to see the full index entry for a death notice that you may have found in the Abbreviated Public Index you will be able to obtain this from copies of the print version that will be available in June 2016 at the Public Library of Cincinnati and Hamilton County, and thereafter likely at other regional/national libraries as listed at Worldcat.